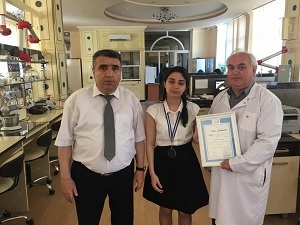 “Effect of Nanoparticles on the Development of Plants in Saline Soil” project by Fidan Ibrahimova, student of the Baku European Lyceum, has been announced as a winner in the “26th International Research Projects Contest”, which was held in Istanbul from May 23 to May 25. The project was implemented at the Nano Research laboratory of BSU under the leadership of Professor Mammadali Ramazanov, Dean of the Physic Department and Docent Ismet Ahmadov. The “INTERNATIONAL RESEARCH PROJECTS” Competition implemented by MEF Educational Institutions for purpose of supporting scientific education, orientating any skillful students in this area to scientific researches and growing them as “Scientists of the Futures” in branches of Physics, Chemistry and Biology is attracted a great attention increasingly every year by high school youth.